Day 1 of the Lillehammer Triple, a three-day series of Nordic Combined races in the storied Norwegian hamlet, began Friday and ran through Sunday. On Day 1, Norway’s Jarl Magnus Riiber, after jumping to sixth place, won the men’s individual Gundersen 5-kilometer in a time of 12:45.7 minutes. Riiber made up a deficit of 47 seconds on the ski for the win. Fifth place jumper, Eric Frenzel of Germany lost to Riiber by 0.1 seconds, after starting the ski 44 seconds back. Third place went to the day’s best jumper, Austria’s Franz-Josef Rehrl. Rehrl finished 5.7 seconds back. U.S. Nordic Combined Team member, Taylor Fletcher jumped and skied to 24th (+1:08.7). Fletcher jumped to 14th place and began the ski 1:13 minutes back. Also for the U.S., Ben Loomis was 49th (+2:45.0), Jasper Good 51st (+3:04.4). On day two in Lillehammer, the International Ski Federation (FIS) brought back a mass start format for the first time in nearly a decade. Athletes went head-to-head Saturday morning in a 10 k skate. The first place skier earned zero points, all other skiers earned negative points based on their time back. Then, in the afternoon, only the top-50 skiers from the mass start began the jumping round. The athlete with the most points after the jumping round, wins the day. Norway’s Riiber again won out. He placed fifth in the ski and scored enough points in the jump to accumulate 131.8 points. Frenzel placed second overall — he placed third in the ski and scored 123.7 total points. Germany’s Fabian Rießle placed third with 123.6 points. Rießle placed second in the mass start ski. Fletcher finished in 39th. He skied to 40th place and had a total of 66.9 points after the jump. Good placed 45th overall; skiing to 50th and earning 56.5 points total. Forty-seven athletes completed the competition, with three being disqualified. The third day in Lillehammer was like groundhog day for Riiber and his competitors. 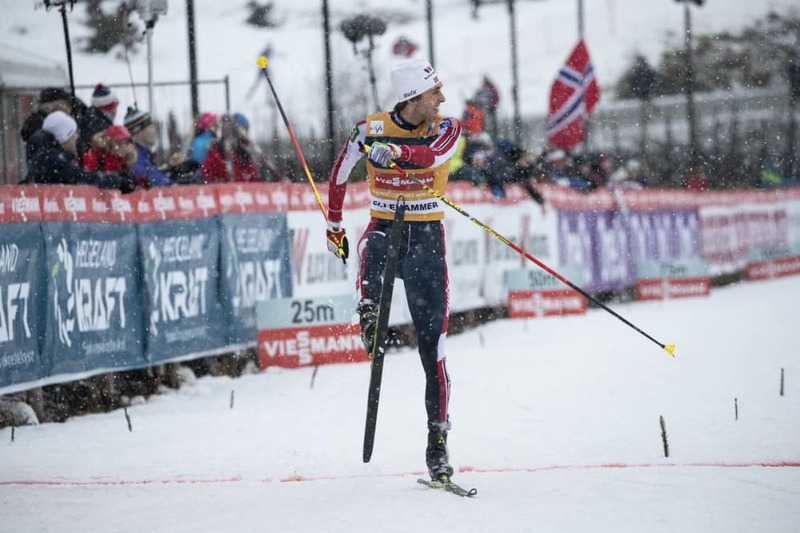 The Norwegian made it a three-peat by scoring the highest during the jumping round and winning the cross-country portion of the day’s individual Gundersen 10 k. Riiber won the ski portion in 27:54.3 minutes to take the overall in the three-day competition. Teammate Joergen Graabak was second (+35.8), and Germany’s Johannes Rydzek third (+36.6). American Fletcher finished in 37th (+5:03.6). No other Americans were entered.